British Automotive has successfully adapted Hawk Cars and Hoyle Engineering's MGB coil-over front suspension to the MGA models. 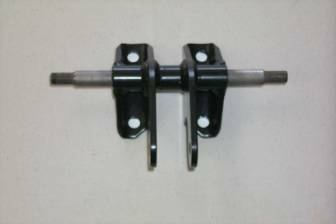 This technical article should be read in conjunction with MGA11A As with the MGB it is necessary to modify the shock absorber mounting platform area. It is our understanding that the manufacturer is working on supplying a seperate MGA coil-over kit, seperate from that of the MGB. However, we bring you the following information so that you can familiarize yourself with what British Automotive has accomplished. We found the following four areas which, needed to be addressed. 1. 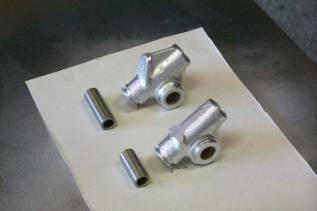 Since the shock absorber mounting bolt pattern on the MGA is the reverse of the MGB, it will be necessary to offset mill (not just simply elongate) the coil-over top mounting bracket bolthole centerlines. 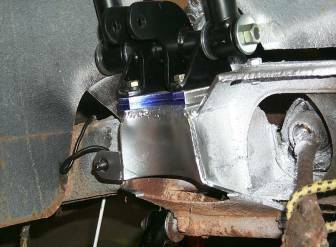 This milling procedure, if accurately carried out, reduces any walking effect of the mounting bracket when bolted into position. The new bolt pattern centerlines will be 2.875" front and 2.75" rear. 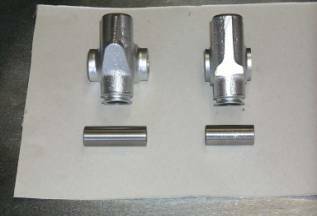 Please note that the original shock absorber mounting studs, lockwashers and nuts have been replaced with 5/16" USS x 1.3/4" grade 8 zinc plated bolts and lockwashers. 4. A major issue, which we ran into, was the difference in the MGB and MGA upper link widths. We solved this problem by machining down the MGA link and shortening the distance tube. We also had to remove the integral upper link rebound abutment. Shown in images 3A & 3B. All this would be satisfactory for both the MGA 1500 1600 & 1622 models. However, we would highly recommend converting your 1500 model from OEM drum brakes to the MGB stub axle and disc brake assembly. With this set up it would not be necessary to machine the upper link and distance tube. More information on converting MGA 1500 OEM drum brakes to MGB disc brakes can be found in technical article MGA5. As previously mentioned, we highly recommend converting the MGA 1500 OEM front drum brakes to MGB disc brakes. 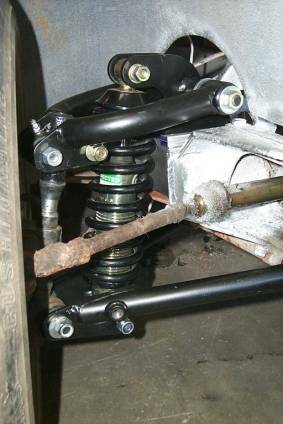 The following image shows the MGB stub axle assembled to the coil-over suspension assembly. Shown in image 4. 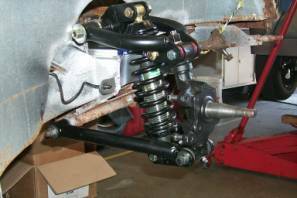 The final image 5 shows the complete assembled coil-over suspension unit as fitted to the MGA 1500 with OEM drum brakes.